With an iconic red rock landscape famed for mountain biking, it remains unbeknownst to many that Moab is also a haven for water sports. With the Colorado River in such close proximity, late summer water flows are lower (translation: safer) so even a novice can enjoy the river. 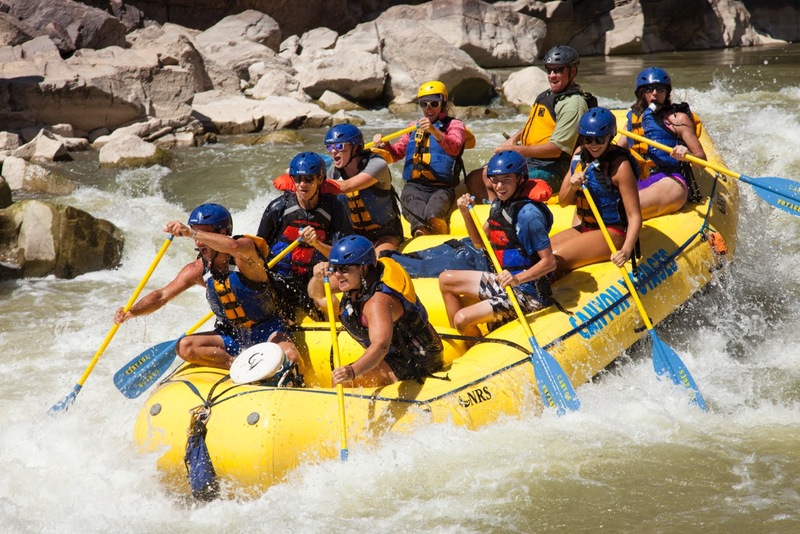 Rafting with one of the Moab expert outfitters down the stretches of the Colorado, known as Westwater, or a longer trip down Cataract Canyon, is a sure-fire way to have fun, and since the rapids are much more navigable this time of year, appropriate for the entire family. Westwater Canyon, named “The West’s Best Short Whitewater Trip” by National Geographic, is a 17-mile river stretch that contains eleven Class III to IV rapids, plus numerous less challenging rapids. Westwater begins near the Colorado-Utah border and runs through deep canyons surrounded by towering walls of black, gold, and red. It can be a one- to three-day trip. Cataract Canyon is at the top of all river runners’ lists and is considered to be among the best whitewater rafting in the country. The most intense whitewater is along an 18-mile stretch containing 26 substantial rapids, which range in class from III to IV+. The rest of the rafting trip is generally much calmer, noted for the spectacular scenery of Canyonlands National Park. A Cataract Canyon tour can take one day or three to five days, covering 112 miles down the Colorado River from Moab to Lake Powell. To book your trip, check out Sherri Griffith, Canyon Voyages, Moab Adventure Center, or Navtec Expeditions. If you’re into a quiet and relaxing float trip, paddle a flat section of the river in an inflatable kayak, aka Duckie, or go for the hard shell in a canoe. Serene and calm, with the gentle sound of water lapping on the side of your boat, you might spy a blue heron or a crane on the shoreline observing you as you quietly pass. It’s a terrific way to get up close and personal with the massive red, sandstone cliffs and learn more about the geology that makes the place so unique. If you’re more of a lone ranger, try standup paddle boarding at Ken’s Lake, five miles south of Moab on Spanish Valley Drive. Get your toes wet at Ken’s, and then graduate to the Colorado. If you have balance – (and we all do, it’s just more latent for some of us), you can SUP. The paddle board is an enlarged surfboard that gives you buoyancy, while your paddle propels you. Ken’s Lake has incredible views of the east side of Behind the Rocks Wilderness Study Area, the La Sals and Arches off in the distant north. For more placid water and less wind, head out in the morning. Rent from Moab Gear Trader or Canyon Voyages. If you’d like instruction, for a fun day the stand up way, contact Canyon Voyages Adventure Co. or the Moab Adventure Center. Take yourself to the river to keep your cool in Moab. You’ll discover a unique side of the desert and learn about what the precious element of water does to rehydrate both the land and the soul.